Fall is a great time to get married, and fall wedding centerpieces are an important part of your reception. As you will see below, there are several fun, creative options for you to consider. If you have chosen a fall wedding theme, you will want your centerpieces to blend in with your overall wedding theme and your wedding colors. Don't be afraid to be creative when designing your centerpieces. Listed below are a few autumn ideas that you can use for inspiration. Flowers are always a favorite for centerpieces in any season, and there is good reason for that. 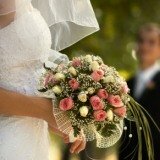 Autumn offers many colorful, seasonal choices for fall wedding flowers that can help brighten up your wedding reception. Popular flower choices for fall include hydrangea, sunflower, autumn leaves and roses. 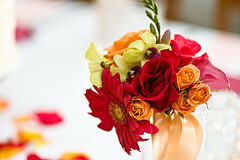 Let the rich fall colors work for you when designing your centerpieces. 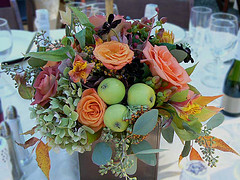 Visit fall wedding arrangements for more floral ideas. 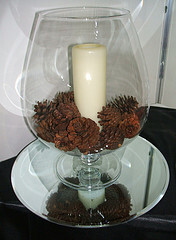 The autumn harvest season brings with it many items that can be used in fall wedding centerpieces. 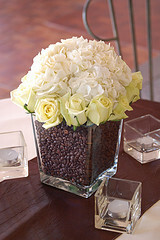 In addition to flowers, consider adding items like pine cones and coffee beans to vases and other containers. Try to match your chosen accent items with the fall wedding theme you have chosen. 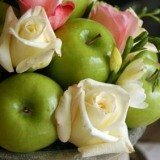 Apples are a sign of fall, and they work really wedding in centerpieces. You may even want to consider using them by themselves in a bowl without any flowers. Bright red and green apples work perfectly for an autumn event. You can try using these colors as part of your wedding colors or as complimentary fall wedding colors. 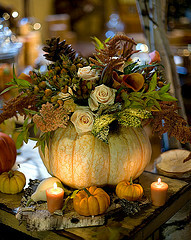 Pumpkins are another great autumn harvest item that make terrific containers and accent items for your centerpieces. 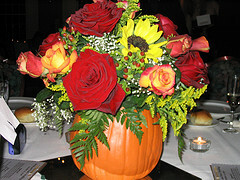 If you are having a Halloween wedding you can even use jack-o-lanterns as your fall wedding centerpieces. 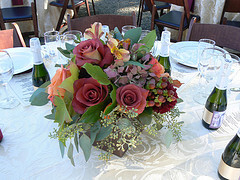 Another popular option for a fall wedding is a wine or vineyard wedding theme. 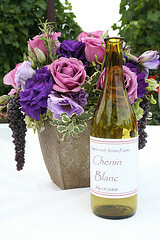 Add wine bottles or other wine related items like corks to your centerpieces for a unique touch. 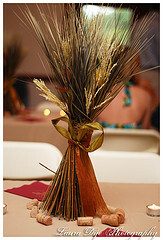 In addition to flowers, wheat and other grasses help set the tone for your fall wedding.